Craig however was spent by this point – his body having been pushed to it’s limit by both the mountain climbing, and the cruel stomach bug. 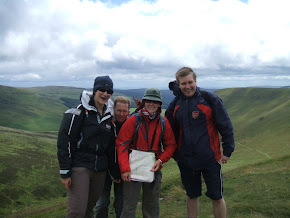 At this point he knew he’d hold us all back from our new goal, so he reluctantly opted not to climb Snowdon. 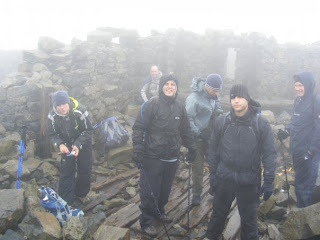 It was still a mighty achievement on his part, to climb the two highest peaks in the UK, within the same day! Well Done Craig! It was a beautiful morning as we started our ascent, with the sun slowing rising behind us as we trudged determinedly up the slope. We were following the Pyg track up, and although on Snowdon we were covering the least elevation, only 600m of it’s 1067, it was a steep and rugged 600m. Still a rather lovely walk, at a time of the day when normally we’d still be in bed. As fate would have it, there was only one cloud in the sky that morning. And that cloud happened to want to sit right over the summit of Snowdon, so after a final push to get the top within the 24hours, we were again greeted by a white out! It didn’t matter though. WE’D DONE IT!! All were very happy to be there, and champagne and fosters and hot Ribena (Carrie’s contributions!) appeared out of rucksacks. 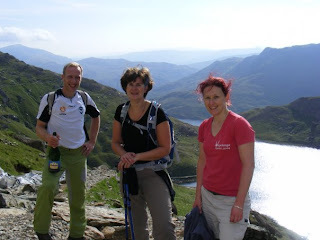 Having made that third summit, the urgency seemed to ease off and we all chatted happily as we slowly descended Snowdon, down to the Miner’s track, stopping for lots of pictures along the way – it really was picturesque! The walk back, although mostly flat, seemed very long, probably because in our minds we’d finished the challenge at the summit! The fact that we all had trains booked home from Liverpool in just a few hours was also playing on Carrie’s mind…. Having left Scotland a little behind schedule the race was really on when we reached Seathwaite, in the Lake District, our starting point for climbing Scafell Pike. It was just after 6.30pm, which meant we had about 2 hours of day light left and we hoped to get a fair way to the summit by then. This was Carrie’s favourite mountain as the route we walked took us over a variety of terrains – valleys, meadows, rivers, rocks, ledges, scree, steps…. 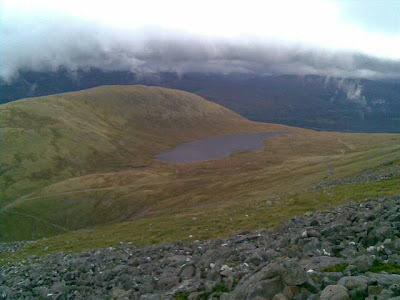 Claire described it as “less nasty than Ben Nevis, but dark” and Craig purely feared for his life for a majority of this peak – being drained from his stomach bug, and his first night mountain experience couldn’t have helped though! 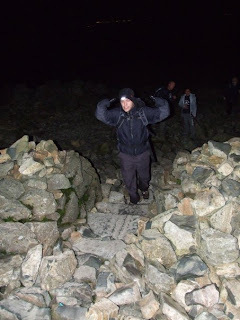 We did a lot of rock scrambling, path finding and scree sliding before finally reaching the summit of Scafell Pike in darkness about 9pm. 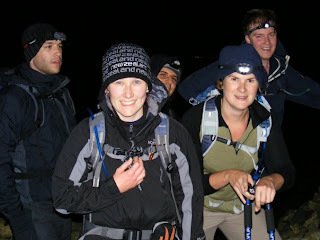 On the summit we were greeted with a fantastic full moon, and clear sky allowing us views over the whole area. Shame our cameras weren’t quite up to capturing the moment. 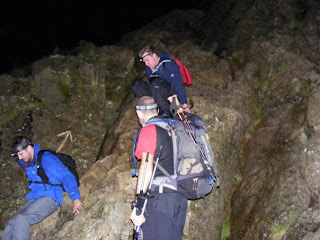 2nd peak under our belts but before we could attempt the 3rd we had the mission of getting down of Scafell Pike, safely, in the dark – unfortunately the route we were walking, up from Seathwaite and along the corridor route, was on the opposite side of the mountain to the full moon!! The night time navigation skills of our guide were tested at this point, as we strained our eyes to find the path back down, that not long earlier had seemed quite obvious coming up! We took the tourist route up Ben Nevis, which let us know from the start exactly what was in store - a long slog that just went on and on and on! It was easy enough to walk, with the lower half a nice wide track with convenient placed steps along a lot of it. Once passing Lochan Meall an t-Siudhe at about the half way point, it then got quite rocky and uneven with a seemingly unending series of zig zags to endure before the summit was finally in sight. Or at least should have been - for the last 45mins we walked in white out conditions so had no idea of how much further we really had to go! On reaching the summit, we had a quick stop for photos (to prove we had made it!) and to layer up (hats, gloves, waterproof over trousers…) and fuel up (Jaffa cakes, Kendal mint cake, flapjacks…) before turning quickly on our heels and heading back down the mountain again. We’d had the path mostly to ourselves on the way up, but back down we passed dozens and dozens of other walkers – a lot of whom we later saw on Scafell Pike and then Snowdon! (see we are not the only crazy ones out there!). We were back down, in the mini bus and on our way a little over 5.5 hours since starting. 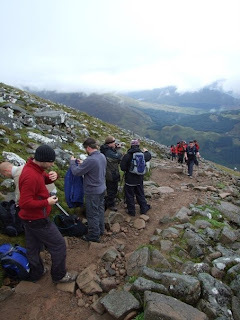 It was a bit slower than we had hoped, but poor Craig had been struck with an untimely stomach bug, which meant he had to make a number of stops en route on Ben Nevis. Enough said. Achey limbs are starting to feel normal agian but the tiredness is stick kicking in! Although I am not so sure all three team mates agree! 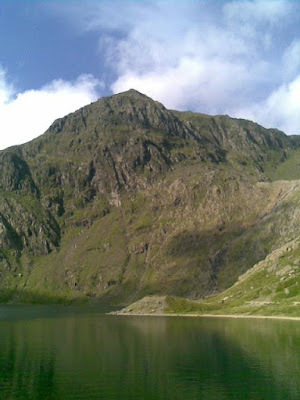 Claire has described it as Nasty (Ben Nevis), Not so Nasty but Dark (Scafell Pike) and Nasty (Snowdon). Craig was struck down from the beginning with a stomach bug, and probably found it the longest and scariest weekend of his life! So I guess that makes Carrie officially the craziest of the 3Cs, as she loved it all and her favourite mountain was Scafell Pike, in the dark!!! Update from a bunkhouse just south of Fort William. We've all got up here safely, after driving through some fantastic scenery in Loch Lomond National Park. All packs sorted for the first mountain, Ben Nevis, which we'll be starting at 7am! Right of to bed now, so i can get at least 5hrs sleep before our a post breakfast briefing at 620am! I'm posting this just before catching a plane up to Glasgow to join Craig and Claire, and the rest of the Meningitis Trust team for the 3 Peaks Challenge. This weekend we’ll be walking 26 miles, up three mountains, in 3 different countries. That’s the equivalent distance to a marathon, but with 2,500m added in just for fun! And no, we don’t get to stop and sleep along the way, any sleeping to be had will be crammed in a mini bus seat as we drive from Scotland to England, then on down to Wales. Over the past 3+ months we’ve spent weekends training, and between us raised almost £2,500 for the Meningitis Trust. Many thanks to all those that have believed in us and supported and sponsored us along the way. This weekend we’ll do you proud! THANKS A MILLION TO ALL OUR SUPPORTERS! We'll try and get some updates up here to let you know how we are getting on, so keep watching! 5 Days to go.... agggghhhhhhhhhh!!! With now less than a week to go it's getting scarily close. I spent all weekend relaxing, and not doing anything too energetic what so ever in preparation for next weekend. The bad news is though, yesterday I was going a bit stir crazy from lack or exercise, last night my legs were aching, and today I seem to be developing a cold! Itchy throat and sneezing all afternoon! Oh well I guess all I can do now is fuel up my body, dose up on vitamin C and hope for the best! Who will be the first of the mountains? 7 Days to go... Thanks to my NZ sponsors! 11 Days to go… Where did the summer go!? We are walking in support of the Meningitis Trust. Meningitis is a devastating disease that can stricke anyone at any age without warning. The signs are often difficult to spot because early on they can be like those of colds and flu. Knowing the symptons not only saves live, but can also help prevent the save after-afters that meningitis can cause.